The Mouflon Ram is a medium sized sheep that stands about 3 feet tall and typically weighs in at about 120 pounds. It's impressive coloring and large curled horns make for a very impressive mounts and High Adventure Ranch has a variety of animals to hunt. We have both Pure Breed & 5/8 (crossbreed) species. 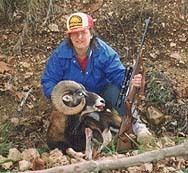 For more information on Mouflon Ram Hunting at High Adventure Ranch, please call (314) 209-9800 or fill out our contact form.